The Market Street Report: 50 years after Freedom Summer, where are we? Summer is winding down, and it’s been a huge season for remembering the tumultuous Civil Rights Era. This year marked the 50th anniversary of Freedom Summer, during which hundreds of civil rights workers and students from across the nation traveled to Mississippi to help local civil rights workers and volunteers attempt to register black voters and set up Freedom Schools and community centers to help black citizens. At that time, it was extremely difficult and dangerous for blacks in Mississippi to register to vote. Additionally, it was a rough time in the South due to Jim Crow laws that mandated racial segregation in all public facilities, including schools and public transportation. These laws also ensured employment and educational discrimination and other economic disadvantages that have had long lasting effects. Freedom Summer brought together volunteers from various backgrounds to try to make a difference. It became a pivotal moment of history for the Civil Rights Movement, with many sad stories of sacrifices made for the hope for racial equality. participated in over three dozen sit-ins and protests by the time she turned 19 years old. It was a perfect time for this event because Joan was on campus celebrating her golden graduation anniversary along with several of her classmates, all with amazing stories. The film is a must-see and really shines a light on many infamous moments during the Civil Rights Movement as well as Joan’s memories of well-known people, including Dr. Martin Luther King, Jr., Medgar Evers, and Stokely Carmichael. 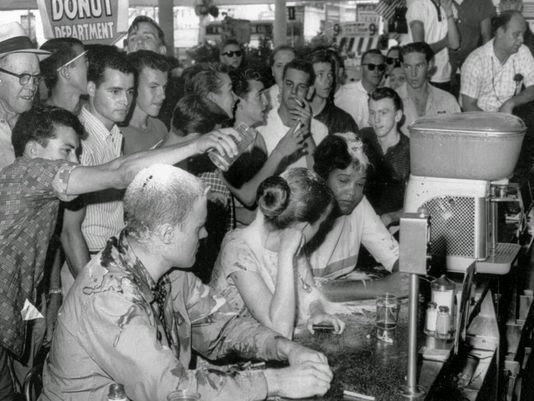 We heard the full account of events leading up to and during the violent Jackson, MS Woolworth sit-in that involved four Tougaloo students (including Joan) and a Tougaloo professor. We heard personal accounts of what happened to three Civil Rights workers James Earl Chaney, Andrew Goodman, and Michael Schwerner, who were brutally murdered during Freedom Summer. The audience was captivated by the film and by Joan’s story-telling during the Q&A portion of the event. The magnitude of terror that citizens endured and the dedication of the ordinary people who fought for change are astounding and heartrending. Fifty years later, clear progress has been achieved, but there’s still a ways to go on the quest for racial equality. The efforts of those who come before us cannot be forgotten. Here are some startling national statistics that are even more troubling in some local communities across the country. According to the U.S. Bureau of Labor Statistics, the June 2014 unemployment rate for all Americans aged 16 and over is 6.1 percent. That figure for white Americans is 5.3 percent, compared to 10.7 percent for blacks. During the Great Recession (December 2007 to June 2009), the national unemployment rate reached 9.5 percent. The highest level of unemployment that black Americans experienced was 15 percent, compared to 8.7 percent for whites. Over the last five years, the unemployment rate for blacks peaked at 16.5 percent in April 2011. The peak for whites was 9.2 percent in October 2009. Blacks were not only hit harder by the recession but for a longer period of time. Of the 27.1 million firms in the U.S. in 2007, 83.4 percent were white-owned, compared to 7.1 percent that were black-owned. Of all black-owned firms, 1.6 percent have sales or receipts of $500,000 and over. Five percent of all white-owned firms have achieved this level of sales. While there was substantial growth in black-owned firms between 2002 and 2007 (60.5 percent compared to 13.5 percent for white-owned firms), much more is needed to reach a distribution that more closely resembles population distribution (13 percent of the population identify as black). According to the U.S. Census Bureau, the 2012 median household income of black Americans is $33,764, compared to $56,565 for white households. The 2012 poverty rate for black Americans is 28.1 percent, compared to 11 percent for white Americans. In terms of educational attainment, in 2012, 18.7 percent of black Americans aged 25 and over hold a bachelor’s or graduate degree, compared to 32.5 percent of white Americans. The gap in associate degree attainment is much narrower—7.7 percent of black adults have associate degrees compared to 8.5 percent of white adults. The percentage of black adults without a high school education is 16.8 percent, compared to only 8.5 percent of white adults. There are myriad reasons underlying each of these statistics, and closing these gaps will continue to be complex endeavors. It is important to remember that racial inequality is a longstanding issue and that what is sometimes considered “black history” is American history—it’s a past that belongs to all of us, and we have to all learn from it. We should be proud of the progress that we’ve made, but we can’t get complacent. As a result of Freedom Summer, many of the barriers to voting were eventually removed and important legislation ,such as the Civil Rights Act of 1964 and the Voting Rights Act of 1965, was passed, and Mississippi now has more black elected officials than any other state in the nation. However, there are still very hefty and disturbing gaps in economic indicators and educational outcomes not only in Mississippi, but across the U.S., that need to be closed. We have to press on, understanding that as opportunities are opened and taken advantage of by minorities, it has a positive effect on everyone. The 2007 Economic Census provides the latest data available. The 2012 Economic Census will be published later this year.